Only keep the number of Koi that is appropriate for the pond size you created. One of the most popular fresh-water pond fish, the Koi, can be found in millions of ponds in the world. They are popular fish because they come in a variety of colors and live long lives. Another reason the Koi is a popular choice is because Koi care is straight forward and easy to carry out. The oldest Koi, found in the record books, died at the age of 226 years of age. There are several outdoor pond fish to choose from, but the Koi is a perfect choice. Koi is the domesticated variety of the common carp. The Koi was bred by the Japanese starting in the late 1820’s. 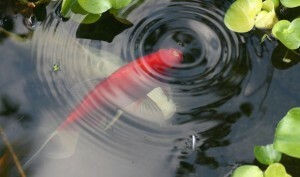 The breeders had to be patient and utilize their breeding skills because the Koi’s look can affect by different things. Both the environment and diet affect the fishes color. Koi do not school, but are extremely social with many different breeds of fish. Be aware though not to include small fish in your pond or your Koi will eat them. Small ponds will keep your Koi schooling together. If you provide them with a larger area, they will live in small groups. Start your Koi care with a 500-gallon or more size pond, this will provide your Koi with ample room to grow. People often start their Koi in a smaller pond, which is fine, but be aware they may get very big and outgrow their pond if you are not careful. If you find your Koi are out growing their pond you can always increase the size of your pond, move the Koi to a larger pond, or purchase smaller Koi and give your large Koi away. Do not overcrowd your pond. Only keep the number of Koi that is appropriate for the pond size you created. If you want healthy Koi, give them plenty of space to live and grow. If you want healthy Koi, you must provide them with clean healthy water. Koi care is important because you have spent a lot of money for you Koi and you do not want to have to replace them because you did not provide quality care. Koi are also cold-water fish and do best in water temperatures that are between 61°F and 75°F. You should have no problem keeping these cold-water fish outside during the winter. If you provide a pond that is greater than 3 feet deep, your Koi will be fine outside during the winter. Koi fish do hibernate and as the temperatures begin to drop, Koi fish will begin to hibernate. Koi slow down their digestive system so they will not eat. If you do feed them, you may find that they become sick because the food in their stomachs grew rancid. So, make sure not to feed your Koi if the temperature is below 50°F. Many pond owners love to hear rippling water as it flows through the yard but adding Koi will create another level of relaxation and fun in your gardening. Koi fish owners who provide quality Koi care will have you enjoying your Koi fish for years to come.